When you’re procuring equipment for liquid deicing, you can’t take any chances. When using it, you’re on a tight timeline in freezing temperatures and you need to perform. Here are some things to make sure of when deciding on equipment for de-icing. Simple Design: The less complicated the design and operation is, then less training is required to operate it. This will help you be more efficient and minimize breakdowns on the job. Name brand components: Having equipment with premium name brand components will increase the likelihood that they are available locally for timeliness when you need replacements. Fast fill system: Having a quick way to hook up and fill your tank in minimal time will no-doubt increase your efficiency. Corrosion free: Using corrosion free components like stainless steel & poly makes the unit last longer and stay cleaner. Easily adjustable boom mount: Having a boom mount that is quickly adjustable to the exact height you desire gives you more control of your application. Fork points: The ability to easily move your unit with forks is a must have. This will save you much time and energy. Fully drain-able tank: Having a sump bottom or fully drainable tank is essential for completely draining your tank during seasonal storage or if you need to switch out the liquid. In-cab controls: Having a solenoid control kit running into your cab is essential to stay comfortable and in top performance during those cold hours on the job. 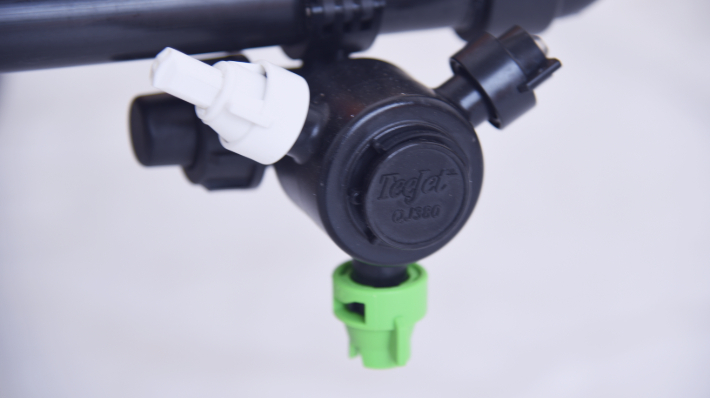 Side output port: An output port to easily fill a sidewalk sprayer makes life simple and easy. Pump Filtration: A quality inline filter mounted to the suction side of the pump will avoid nozzle plugging & inconsistent spray patterns. Hi-vis: A bright or highly visible unit will maintain safety. Surge control: Baffle balls will majorly increase the stabilization of the vehicle and make it transport like a fixed load. Corrode Proof Material: Stainless fittings & tank material will keep your tank corrode proof, increasing the safety and longevity of your storage. 10-Year Warranty: It's simple. Get an awesome warranty. At Ice Master Systems all tanks come with a whopping 10 year warranty (free of charge). Robust Structure: With design like the Strong-X™ roof & Ribbed Wall™ tank walls you know you're safe storing liquid brine with no worries. Fully drain-able tank: Definitely get a tank with a sump bottom so you can fully drain and clean your storage tanks. Light colored tank: A lighter tank will give you the ability to easily see the liquid level in your tank without having to check through the lid. Quick and easy. Lifting lugs: Having lifting points on the top of your tank makes it much easier when you are installing your storage tanks. Pro tip: Check with your local authorities for approval on storage requirements! Sign up to our blog to learn the best answers to popular questions about Ice Control!